How to be more visible on social media? How to gain more followers fast? Social media mastermind Gary Vaynerchuk wrote an amazing book explaining all these things. Jab, Jab, Jab, Right Hook: How to Tell Your Story in a Noisy Social World is the book this blog post is about. From all the books I had on my list, this one took the longest to finish. Contrarily to how this might sound, the book was not bad. In fact, it ranked as the second best so far, right after REWORK. 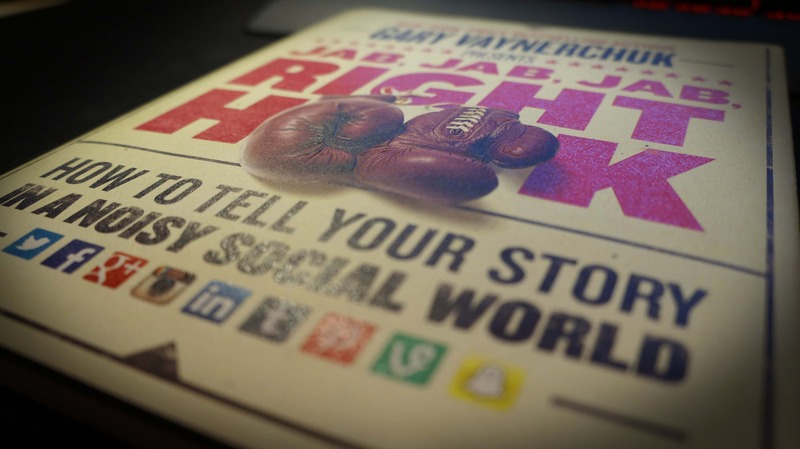 Jab, Jab, Jab, Right Hook (JJJRH) is a book written in 2013 by a well known social media guru Gary Vaynerchuk. In JJJRH Gary teaches you how to market yourself and your business in the most popular social media networks like Facebook, Twitter, Instagram, Pinterest and Tumblr. The name of the book might seem a bit off. Judging from the title you might expect this to be a sports book. Instead, it teaches you how to perfect your social media posts. The reason for such a name is that the author himself is a fan of boxing and compares social media posts to jabs and right hooks. Jabs are occasional posts that are interesting, expressive storytelling, yet don’t want anything from the fans. They are just there to offer entertaining content to the world. Right hooks, on the other hand, are rare occasions when you ask your fans to support you or buy your product. Gary says that if you jab often enough and rarely throw a right hook, then fans have nothing against giving back to you. So in other words, to profit on social media – give, give, give, ask. It’s a chaos out there in social media. Hundreds and hundreds of people trying to be heard every minute. How do you stand out from all this noise? Scream louder? Nah, that won’t work. If you don’t have anything interesting to say, people just won’t care. Yet, if you do have something interesting to share, but don’t know how, it still might fall on deaf ears. I feel that the beauty of today’s social media networks lies in the equality. Everybody can be heard. Everybody can chime in. And also everybody can ruin their public image. (That is of course if they interact publicly.) That is equally as scary as it is satisfying. You don’t have to be a multi-million business or a celebrity to move mountains and start world-changing events anymore. That is fascinating! I like how Mr. Vaynerchuk described good and bad ways to make social media posts in his book – he had real-life examples. Big businesses do make amateur mistakes on social media, that gives us, smaller guys opportunities to be better. I will touch on some good points I found from this book on the three social media platforms I find to be the most important to me. How to Write Better Facebook Posts? Post something eye-catching that a fast newsfeed scroller would stop and look at for at least for a second. Tell a story! But keep it short. Nobody has time to read several paragraphs. Add your company logo to the picture. How to Write Better Tweets? Interact with other people. Like, retweet, comment and conversate. Chime in on trending hashtags & topics. How to Create Better Instagram Posts? Create art. Make sure it doesn’t look like an advertisement or a stock photo. It has to have value and has to fit with the Instagram style. Your post needs to have value and has to tell a story! JJJRH has multiple examples of businesses failing with this core rule. Every post has to have enough value for people to stop what they are doing and interact (like/share/comment) with your post. Overall, this book was an amazing read. Full of useful knowledge any today’s entrepreneur should know. Tho you should keep in mind that this book was written 5 years ago, back in 2013. Many things have changed since then. These big social media companies compete with each other every day. So they constantly try to improve their products to stay on top. While reading Jab, Jab, Jab, Right Hook I must have watched 20 or more of Gary’s YouTube videos. He has an amazing YouTube channel where he posts fairly often, which I recommend checking out too. His videos motivate and give useful life tips and often have unique perspectives on life’s challenges. So much of people’s time is spent on social media sites, so creating an appearance there has tremendous value. After all, throwing successful jabs and right hooks online can cost close to nothing, while putting up billboards that people are already used to ignoring can cost a fortune.